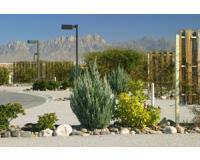 Hacienda RV & Rally Resort is New Mexico’s Newest & Finest RV Resort. Hacienda RV and Rally Resort is conveniently located immediately off I-10, Exit 140 in Las Cruces, New Mexico. The RV resort is within walking distance of historic Old Mesilla (Billy the Kid’s hangout) and all the special shops and fine restaurants it provides. Yet we are only minutes to downtown Las Cruces, the second largest city in New Mexico, offering theaters, museums, wonderful dining, and gracious Southwest hospitality. We are proud to be your host at Hacienda RV Resort for as long as you would like to stay! Longitude -106.78677 / -106º 47' 12"
Latitude 32.28630 / 32º 17' 10"
This is one of the best parks we've stayed at in a year. Easy access for big rigs, paved streets and level gravel lots with pea gravel that eliminates the dust. Each lot is separated by vegetation that gives you privacy. Close to everything in Las Cruces. We liked it so much that we extended our stay. Wonderful oasis in a land of dry,dusty, sparse campgrounds. Wonderful clubhouse like office with two fireplaces to lounge by. Nice continental breakfast and friday night is free Margarita night. They back choc. chip cookies wevery afternoon for the guests to have if they come by the office and yes there is internet at the office. The hot tub was very clean and just right after a long day of 4wheelin' or hiking on the trails. The check-in was quick with lots of organization. Good information about the locale and a map with good directions to surrounding areas. Gravel sites, no tables, close but staggered so that you have privacy and everyother campsite has a large wooden fence with shubbery for a more secluded feeling. Curbside garbage pick up and the gravel is even raked between reservations so everything is neat and orderly at all times. Will stay again on our way back thru from Alaska. This is a very nice park with all the conveniences. We were escorted to our site after a pretty quick check-in. The regular sites are side by side. However, they are wide enough slides from both coaches can be out and there is still room enough to walk. They are gravel with only the end ones having any grass. There are no tables or pads. The laundry room, restrooms, showers and exercise room are all locked and require a key card to get in. Everything is very clean. There is garbage pick up daily at your site. There is a free continental breakfast and complimentary paper daily. The building where you check in reminds me of a motel lobby. The dog run is enclosed and long. Although we don't have a dog with us, it looks like a nice one. The Internet connected quickly, but was slow at times loading pages. It is close to attractions in the area. Following the directions from their website made it a little difficult to get from the far right lane off the Interstate to the far left lane immediately. After that, there was no problem. We would stay here again.